Who do you think is the most utterly pointless hero ever to appear in any comic? For me I'd have to go with Aqua man who just seems utterly useless in any real situation I can possibly think of. I mean if I was held up in town the only place he'd be of any use is the fish pond by town hall or the fish and chip shop if the fish arnt dead yet. [quote="Hourglass"]Who do you think is the most utterly pointless hero ever to appear in any comic? But two-thirds (or something) of the Earth is covered in water! True but unless the crime is committed at sea he's still pointless. Hourglass wrote: True but unless the crime is committed at sea he's still pointless. Haven't read the comics to know: are there nasty aquatic people for Aquaman to battle? 'Cos Marvel's Sub-Mariner would be pointless if not for his fellow water-dwellers. Aquaman's rogues gallery includes such unforgettable characters as the Fisherman and the Scavenger. His arch foe, though, is Ocean Master, a modern day pirate who is coincidentally his half brother. Ocean Master once made a deal with the Devil which gave him super powers as long as he was holding his trident. Unfortunately, he forgot to read the small print, which left him in unbearable agony if his hand was physically separated from his trident. Which must have been awkward when changing his shirt, or eating. He really was that dumb. The single most pointless superhero though, in my opinion, would have to be Matter eater Lad of the Legion of Superheroes. As his name implies, his was the super ability to...ummm...eat things. Anything, in fact. As long as it was inorganic. So, not including actual food. The LSH also gave us Stone Boy (who could turn into a statue but was totally immobile in that form), Infectious Lass (who made people sick) and the unforgettable Arm-Fall-Off Boy. Another contender would be Marvel's the Thin Man, who had the power to become super thin. LOL!!!!!!!!!!!! my sides are splitter >< these are truly terrible super powers. reminds me of that spoof superhero film I saw, cant remember what it's called. One of them throws c utterly mainly spoons and has god awful catchprases like "nice to see you so spoon"
There's then the Shuffler who hits people with a spade an then a bloke whose power is he just gets easily angry. Mystery Men. The guy with the spoons was 'the Blue Rasjah', who spoke in an affected English accent and called himself the zen master of cutlery. The other guy was Mr Furious, played by Ben Stiller. Great movie. It was based on the comic book which introduced yet another of the lamest superheroes ever, the Flaming Carrot. But the Carrot was deemed too lame to actually be in the film..
What was the name of the person who could turn invisible but only when no one was looking at him? I do love that movie, much watch it again sometime, utterly brilliant. Hourglass wrote: What was the name of the person who could turn invisible but only when no one was looking at him? Not a superhero, but possibly the most pointless villain was the Stilt Man, a thief whose gimmick was stealing things from high buildings while wearing a suit of high tech armour with telescopic stilts attached. He had a long and unmemorable career which saw him beaten up by everyone from Daredevil to Black Goliath, before the Punisher took one look at him and blew his legs off. Team-wise, Section 8 are useless, although that's they were created to be. Their classic character has to be Dog Welder! With Bueno Excellente a close second. Spiff_B wrote: Team-wise, Section 8 are useless, although that's they were created to be. Their classic character has to be Dog Welder! With Bueno Excellente a close second. Similarly odd but rather more heroic was another DC character, Flex Mentallo, Man of Muscle Mystery, a reimagining of the guy who featured in the long running Charles Atlas ads. Whatever happened to him, I wonder? Yeah from Hitman. I found Dog Welder unforgettable! tony ingram wrote: Similarly odd but rather more heroic was another DC character, Flex Mentallo, Man of Muscle Mystery, a reimagining of the guy who featured in the long running Charles Atlas ads. Whatever happened to him, I wonder? I read one modern issue of it -- Frank Quitely artwork? -- and it was pretty odd. One of Grant Morrison's stranger ideas from an already pretty bizarre run on Doom Patrol. Flex's supporting cast included the evil Waxworker, the heroic Green Cigarette (who later turned up as a villain in Animal Man) and The Fact ('he is'). That's the best answer I've heard...ever! GBF wrote: That's the best answer I've heard...ever! OK, now I know one of you is Marshal Law-but which one? If he was already invisible, how would you/he know if you were looking at him?? in order to come visible, if that makes sense? If he was already invisible, how would you know if you were looking at him?? in order to come visible, if that makes sense? I don't think that was ever addressed-though it was established that he could remain invisible if only being looked at by security cameras. I think the implication was that if he knew he was being observed, he'd become visible. But I could be wrong. Great comic book . . . but oh my lord, that movie was AWFUL! I liked it. And not even just for the delectable Lea Thompson as Beverley. tony ingram wrote: I liked it. And not even just for the delectable Lea Thompson as Beverley. I liked it too! Of course, I was a little boy when I saw it and I've never read the comics, so that might have to be taken into account. And did you pay/waste good money to see it in a movie theater? Oh, the awful fashions back then! And you can go right on and be dancing with yourself. . .
Ah, that takes me back! How can you say that decade didn't have style? Well, at least nobody was wearing skinny jeans. I'll give them that. Lucy McGough wrote: Well, at least nobody was wearing skinny jeans. I'll give them that. Skinny jeans on the right person aren't bad . . . it's when the wrong person wears a pair that are too small that one must hide thy eyes for fear of going insane! That poor woman must be awfully uncomfortable. Lucy McGough wrote: That poor woman must be awfully uncomfortable. 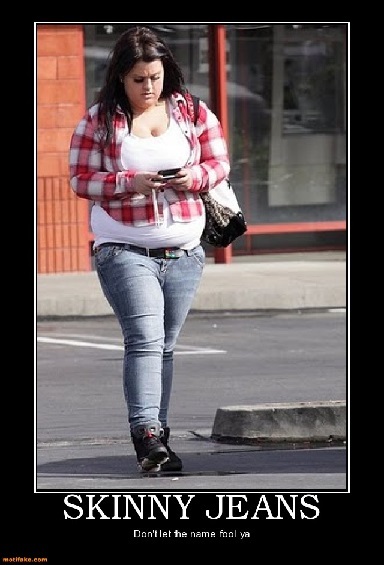 Maybe she's sending a text message to some place Weight Watchers or Jenny Craig in that picture . . . or maybe not.